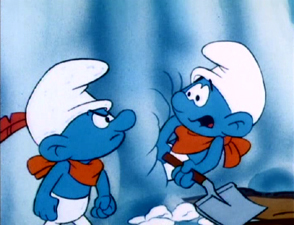 In five classic episodes from the beginning of the show’s second season, the Smurfs face-off against new villains and participate in exciting adventures. The popular show returns to DVD in a new kid-friendly, single disc release for more casual fans of the show. To be a fan of The Smurfs means to be a child of the 80s. If you were a little kid at some point in the eighties, odds are that you watched this popular show at some point. Some people watched it because of the cute characters and others for the adventure. Whatever the reason, there was no denying the appeal of The Smurfs throughout the decade. The show ran for 9 seasons between 1981 and 1990 and was an instant success. Created by Belgian cartoonist Peyo, The Smurfs (Les Schtroumpfs in their native Belgium) are a group of small blue creatures (three apples tall) that live in their own village in the forest. Led by their leader, Papa Smurf, they work and play in the woods while constantly avoiding the evil wizard Gargamel and his cat Azrael. In February of 2008, Warner Bros. finally released The Smurfs in the United States when Season One, Volume One was released containing 19 episodes. Later that year, a second volume was released with an additional 20 episodes. 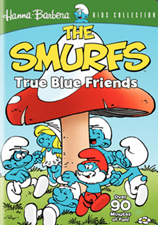 While a second season volume has yet to be announced, Warner has released a third DVD containing 5 episodes from the show’s second season, entitled True Blue Friends. This release, under the Hanna-Barbera Kids Collection label, is the first of a series of one-disc, kid-friendly DVDs that Warner is releasing for some of their series. One of the reasons the Smurfs were so successful with kids was because of the different personalities in the show. 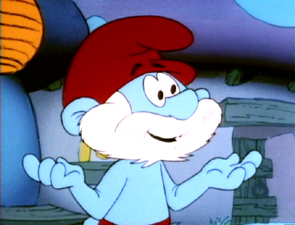 While every Smurf is basically a carbon-copy of the next (with a few exceptions), each of them had an entirely individual characteristic and way to act. All of them wore while pants and white hats, but each of them was good at a particular task, usually denoted by their name. Brainy was the smart one, Jokey was the prankster; Grouchy was always in a bad mood, and so on. There was always one character for kids to relate to and they reflected different parts of kids’ personalities in the show. Most Smurf adventures were comical in nature, but there was always an element of adventure and action in most stories. Usually, one Smurf would be misunderstood by the others, or decide to go out of the village on their own and eventually got into trouble. 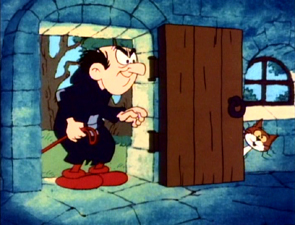 The villains were almost always Gargamel and his cat Azrael, but there were other ones as well. In the end, what the show taught kids was that it was okay to be different and express one’s personality. It also demonstrated the strength of a group faced with adversities and showed how important it was to stick together. In this set, the five episodes are all from the beginning of the show’s second season. They were originally broadcast between September and November of 1982. The five episodes are: S-Shivering S-Smurfs, Turncoat Smurf, The Smurf Who Couldn’t Say No, The Haunted Castle, and The Black Hellebore. The first episode, S-Shivering S-Smurfs, begins with Tracker walking through the woods and sensing that a big blizzard was on the way. He tries to warn the other Smurfs, but no one pays attention to his warnings until he tells Papa Smurf. Papa Smurf then advises the village to get ready for winter and begin their winter-preparation chores. However, in disbelief, the Smurfs slack off and end up being unprepared when the snow arrives. Because Tracker is the only one to make a winter coat, the other Smurfs fight over it and begin to blame one another for the lack of supplies. When some of the Smurfs get sick and require Smurf root, it is up to Tracker to brave the elements (and Gargamel) to find the root and save the village. This is a cute episode with a good moral. It is similar to the classic grasshopper and the ants parable, with a “smurfy” twist. Tracker was always one of my favorite characters and it is fun to see him in his own episode. 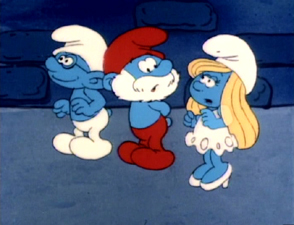 The second episode is called Turncoat Smurf, and it begins with Clumbsy and Vanity facing a close call against Gargamel. Tired of his threats, Papa Smurf draws up a potion called a “personality improver”, but when his potion doesn’t work properly, he decides that it is time for him to take a rest and he goes into a three day trance. While Papa Smurf is asleep, the other Smurfs decide to take a break from work. However, Brainy decides he will keep track of what everyone is doing to report to Papa Smurf when he awakens. However, the others begin to suspect that Brainy is up to no good. When they investigate, they see him leaving a pile of laundry next to the river which Gargamel eventually uses to sniff out the Smurf village with his new tracking dog. It is then up to Brainy to save the day and prove his innocence. This is again an entertaining episode. Brainy was usually a very annoying character, but as this episode proves, he did have his endearing qualities. The Smurf Who Couldn’t Say No is the third episode on the disc and begins on the day of the Firefly Festival. Throughout the day, everyone manipulates Pushover Smurf to take on their duties for the day. While working at a mill, Pushover laments on his inability to say no. As the day goes by, the other Smurfs begin to ask him for more help and he is eventually overwhelmed by all the requests. By the time the Firefly Festival comes around, Pushover is so tired he doesn’t even have the energy to take part in the activities. That night, Scaredy is appointed to be the Foxfire Smurf who must go into the swamp to light his torch. With no one else to turn to, Scaredy asks Pushover if he can do it for him. Pushover reluctantly goes into the swamp, but accidently puts out the fire and awakens the Marsh Monster. When he does not return the next morning, Scaredy decides that it is up to him to rescue Pushover, despite his fear of the swamp. Pushover was not a regular Smurf, but the highlight for me in this episode was seeing Scaredy get the courage to do something brave for a change. The final two episodes on this disc feature the characters Johan and Pewitt. It was actually in a Johan and Pewitt comic book where the Smurfs made their first appearance in 1958. The two would also be featured in The Smurfs and the Magic Flute film and made regular appearances throughout the show’s run. Johan is a young squire who travels the countryside looking for adventures with his sidekick Pewitt, a dwarf. In The Haunted Castle, Brainy, Papa Smurf, and Smurfette are in search of a pond when they get stuck in a rainstorm. At the same time, Peewit and Johan are also stuck in the rain and find shelter in an old, abandoned castle. Eventually, the Smurfs also make their way to the castle. 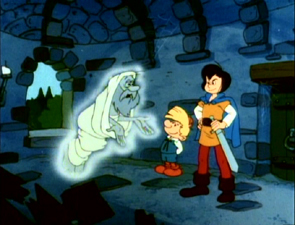 Here, they find an old ghost who tells them he is cursed to haunt the castle. The only way to free him is to break the curse of an old sorceress who brought a drought to his land. This begins Johan and Peewit’s quest to break the curse and later to find the one true-heir to the castle. The final episode of the disc is another Johan and Pewitt adventure called The Black Hellebore. 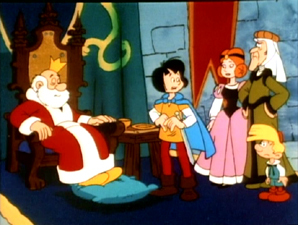 In the beginning of the episode, Papa Smurf warns the other Smurfs about the Black Hellebore flower. Apparently, it is a dangerous and evil flower that is used to cast spells. In a nearby castle, a local wizard cooks up a potion to put the king to sleep and ransom the antidote for money. Johan and Pewitt then have to resort to Homnibus (a local wizard) and Papa Smurf to help awaken the king. The second part of the story features Cloderic, using the Black Hellebore to conquer the kingdom. He uses the flower to control the actions of the guards and the Smurfs and it is up to Pewitt and Johan to save the day along with their friends. I found this episode to drag a bit in parts and there were some unnecessary subplots here and there. While not my favorite episode, this is a good example of a typical Smurfs adventure episode (despite not showing the Smurfs very prominently). Warner has placed a few small featurettes in this release. Unlike the previous volume release, this one is targeted squarely at children, so it is not surprising that there are only a few bonus features. The main feature is a “Meet the Smurfs” menu where one can watch clips about Papa Smurf (1:28), Grouchy (1:01) and Tracker (1:18). In each character clip, a narrator talks about the importance of that Smurf in the village and their characteristics. I imagine that as new volumes are released, we will get to see clips for other characters as well. There is a small Easter Egg in this section called Smurfy Storyboards: “Gormandizing Greedy” (2:20). Finally, trailers are also included in the set for Peanuts: Deluxe Holiday Collection, Sesame Street Presents Follow That Bird, Scooby-Doo, Where Are you? Vol. 1, Tom and Jerry Tales: Vol. 6, The Real Adventures of Jonny Quest, and The Wiggles Present Dorothy the Dinosaur. This DVD is being released in a standard one-disc black keepcase. 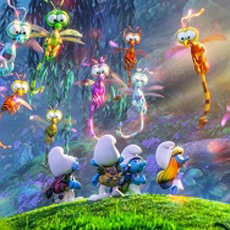 The cover features six Smurfs dancing around a large mushroom. The cover features a green band on the top, denoting this release as a Hanna-Barbera Kids Collection. My only (small) complaint about the cover is an exclamation at the bottom saying “Over 90 Minutes of Fun!” The episodes run for a total of 103 minutes and I can’t imagine why someone did not think that “over 100 minutes” would have been a better selling point. These are old cartoons and the quality of the prints is not the best. With little preservation and cleanup, there is plenty of grain and scratches noticeable in the print. There are also some cell shadows and ghost cells that appear. However, this quality in the image is consistent throughout the DVD and the show’s quality makes up for it. 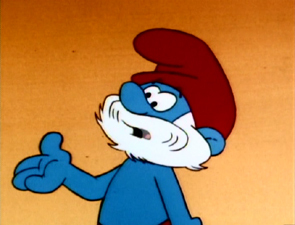 The only episode that seemed a little bit different in color was The Smurf Who Couldn’t Say No. 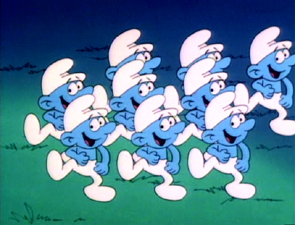 Here, the Smurfs looked much brighter and there is a different quality to the animation. Overall, the quality is what I expected from this release. The episodes run for a total of 103 minutes and are featured in their original 1.33:1 aspect ratio. The show sounds pretty flat with a basic English Mono track. While some people will probably be happy to hear the show in its original quality, I was a little surprised we did not even get a 2.0 track. Either way, it is not the best track, but it is adequate for this release and for what it is trying to be. Subtitles are also included in English and French. This is a release aimed squarely at children. Most likely, these episodes will be included in the Season Two, Volume One release of the DVD if it ever comes out. There has been some discussion on the sales figures of the first two volumes and about who is buying these releases. While it was popular in its heyday, I am not entirely convinced about the popularity of the show among serious animation fans (the ones that buy DVDs). At least, I am not sure most people want to buy all nine seasons of the show on DVD. I think that Warner’s purpose here is to attract new fans to the show by releasing these kid-friendly DVDs for parents who grew up watching the show in the 80s. Honestly, the show is fun, but only in small doses. We’ll see where Warner goes from here, but fans should at least be glad to see these on DVD.